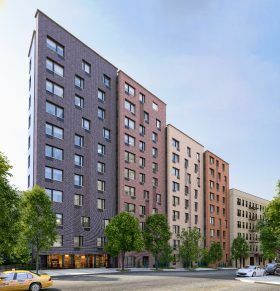 Located in the Mount Eden neighborhood of the South Bronx, this affordable housing building at 1561 Walton Avenue sits just off the Grand Concourse and a block south of the Cross-Bronx Expressway. The 11-story residence contains 60 units total and includes an on-site manager, rear patio, laundry, and storage space for bikes, as well as on-site college application assistance and work-readiness training. Applications are currently being accepted for 50 of the units, ranging from $558/month one-bedrooms to $1,740/month three-bedrooms for those earning 40, 50, 60, or 80 percent of the area median income.